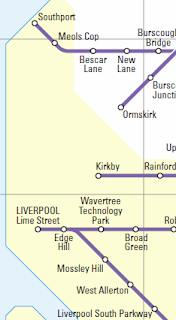 I've been over-analysing the Merseyrail map for years, but I've never really turned my attention to the Northern Rail map. As they've just issued a new version, it seems like a good time to take a look. It does the best it can with a difficult job. 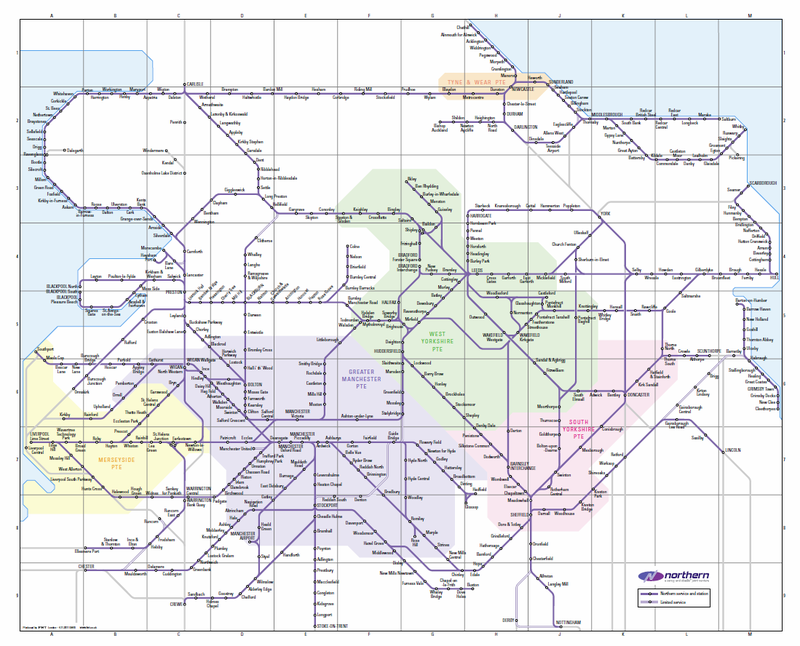 Northern Rail's a wandering octopus of a network, with no real centre and tentacles flailing across half the country. It's a commuter service in Liverpool, Manchester and Leeds; it's a rural connector in Yorkshire and Lincolnshire. 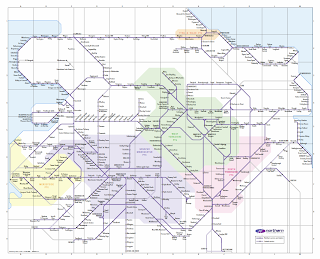 It has to cram in hundreds of station names as well as Passenger Transport Executives and limited services. After all this, it's a miracle that it's even legible. The new map, issued this month, replaces one from January 2010 which was well past its sell-by date. This version doesn't change much, but its alterations improve that version 100%. That pair of grey lines opens up new journeys that the old map seemed to say was impossible. If you wanted to get from Liverpool to Newcastle on the old map, you had to go via Carlisle - this presents an alternative. 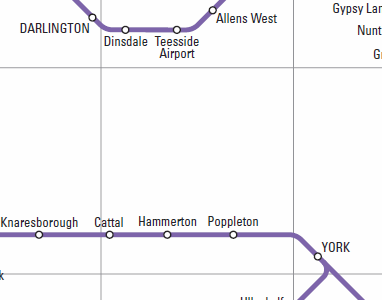 Speaking of the West Coast Main Line, it now appears in full on the map. 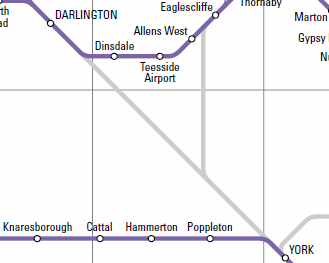 From a purely aesthetic view, it would have been nice if had formed a straight vertical axis from top to bottom - there's a kink around Earlestown and Newton-le-Willows - but at the end of the day, it doesn't carry Northern Rail services, so they're not bothered. What else? The line through Lincolnshire has been straightened into a single diagonal, perhaps to make it look like a more desirable option now the through line via Scunthorpe has appeared. 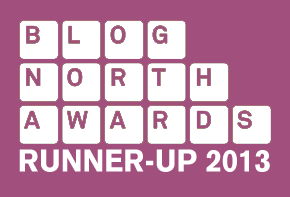 It means that South Yorkshire's been shrunk as a result but is much more pleasing, visually. 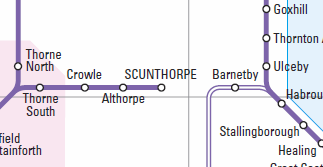 I'm not keen on the two lines heading south though, one through Retford and another between Worksop and Shireoaks; it looks sloppy, and since both lines then head straight off the map, it's unnecessary. You could have just had the East Coast line via Retford and it would have been fine. 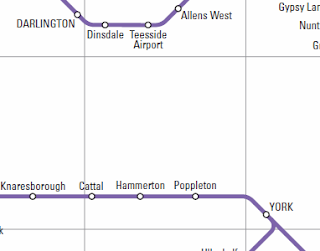 It's not perfect - the way it folds into the City Line after West Allerton implies that through services to, say, Widnes are available - but at least it's there. 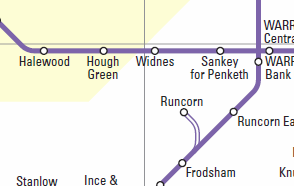 The Wirral Line is completely absent. 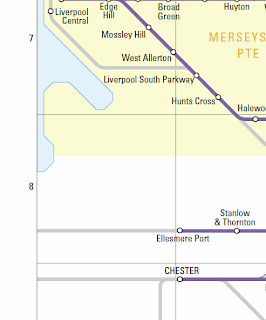 The peninsula itself is a weird little nub on both versions of the map, and it seems redesigning it to accommodate the Merseyrail service was too much bother. It does mean, however, that Chester has a missing connection to Liverpool. Worse, there's a grey line from Ellesmere Port disappearing off into Wales! 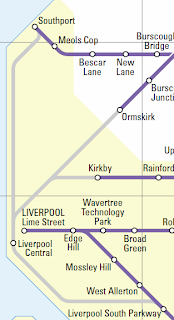 I accept that fitting all four branches of the Wirral Line, plus the tunnel under the river, would have been complicated. 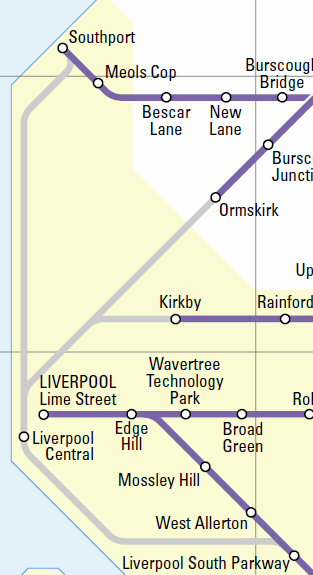 Perhaps the New Brighton and West Kirby lines didn't need to be shown. A simple diagonal heading from Chester and Ellesmere Port and then crossing to Lime Street and Central wouldn't have been too complex. You don't even need to show the loop, or Moorfields and James Street. It's doubly strange given that Merseyrail and Northern are owned by the same company and so are presumably keen to encourage passengers to transfer between services. The biggest news for me, as a person trying to visit every station on the map, is the fact that there are eight stations on the new one that weren't on the old one. One is Liverpool Central, which I've obviously already been to. Another is Buckshaw Parkway, which finally makes the map a year and a half after it opened. Again, I did this one ages ago. The addition of the West Coast Main Line means that there are now four more stations in Cumbria. 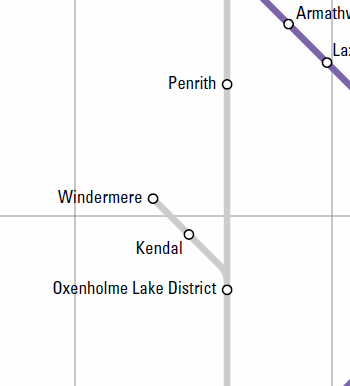 Yes, the Lake District has finally made it onto the map. These aren't all the stations in that part of the world - there are actually two local halts, Staveley and Burneside, between Windermere and Kendal - but they're certainly the most important ones for tourists heading to the area. I'm ok with this. 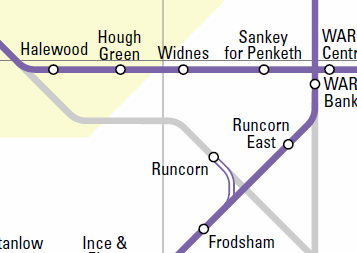 As was pointed out by Neil in the comments to my Cumbrian Coast Line epilogue, ignoring this area just because Northern Rail didn't serve it seemed childish. It also means I can stock up on Kendal Mint Cake. More annoying are the appearances of two heritage railways on the map. The service to Pickering is operated by the North Yorkshire Moors Railway; a fine organisation and one that runs a remarkably good service in that part of the world. It's a seasonal tourist line though. Its timetable can change from day to day. It's not a legitimate service in the same way the other routes on the map are. I've just been to Ravenglass, Northern Rail! I thought I'd crossed that whole line off! Now you've gone and added the heritage route to Dalegarth on, I have to go back. This is very irritating of you. I also feel sorry for the railways that haven't made the map. How about the Keighley & Worth Valley Railway, just as an example? It shares a station building with the main line railway, it goes into an area of the country unserved by National Rail, and it's a major tourist route. There's even plenty of room for it to fit on the map. 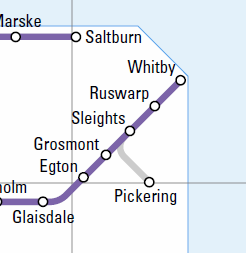 I don't often advocate less information on a map, but Pickering and Dalegarth are two completely different types of rail service. One thing I would add to the map are local interchanges. Manchester's Metrolink and the Tyne & Wear Metro are major transport services, but they're nowhere to be seen on this map. You wouldn't dream of producing a map of London's railways that didn't include Underground interchanges. A small tram logo in Manchester, for example, and an M in Newcastle, would show that there are further routes available off map. In fact, you could go back to Merseyside, get rid of the clumsy Northern Line and stick a Merseyrail M next to the station name - simultaneously solving the Chester/Ellesmere Port error in the process. My conclusion? Not bad, Northern Rail, not bad. 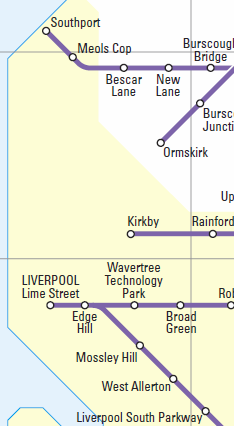 There's certainly nothing as heinous as the Merseyrail SQUARE on this map. Now if you'll excuse me, I have to go and adjust my running totals spreadsheet to include the new stations. No, really, that's FINE. I wonder if "PTE" actually means anything to anyone? Wouldn't they be better off putting Merseytravel area, Metro area, Transport for Greater Manchester area etc. Wouldn't look pretty but at least people in each area (who are probably the only people who really need to know) would have a better idea of what they mean. "Scunny"? "Slag heap"? Do you work for the tourist board, Mark? The problem with "PTE" is there's not really any other way to put it. Metro area has the unfortunate clash with the Tyne & Wear Metro, Merseytravel is a bit too close to Merseyrail for comfort, and Transport for Greater Manchester is just a bloody awful name. Of course, the ideal would be to put "county" but that's sadly long gone. The key part is the colour, really. 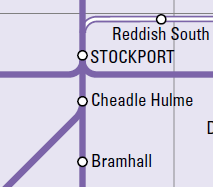 If you arrive in Manchester you can just say, ok, my one day pass can take me anywhere in the purple area. You can pretty much work out what it is without the description.